On the 28th of January, our family visited the Museum of classical archaeology. 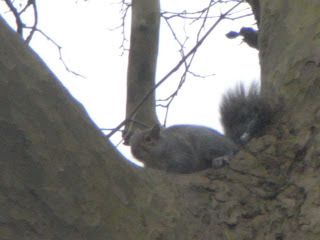 On the way there, we were surprised and delighted to see, not one but three grey squirrels! This time, I got a picture. In the museum there were hundreds of plaster casts of Ancient Greek and Roman People and things from myths. There were also massive plaster casts of Greek Gods and of men and women. My favourite Greek god is Apollo, The god of the Sun, music, poetry, medicine, light, plague, oracles, knowledge and the arts. One of the myths involving Apollo is called Apollo, Daphne and the slaying of Python. Here it is. 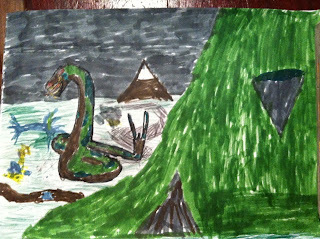 There was once a monstrous serpent,by the name of python who was the child of Gaia, the Godess of the earth. It was created from the slime and to the mud on the ground after a massive flood. The serpent slithered it's vast, grotesque bulk , polluting streams, destroying villages and flattening trees till it reached the mountain were the Oracle of Delphi lived. It wrapped itself around the mountain and guarded it, keeping everybody in need of an answer from the Oracle, out. The great beast reared up to face Apollo and hissed, flicking it's forked tongue in and out of his mouth. Apollo pulled back his bowstring and shot at the monster. Apollo's aim was true, it got Python in the heart and killed him. Apollo then walked through the lands that Python had destroyed, fixing everything. Now contrary to what you would think, the Greek gods were not flawless perfect figures, in fact some of them did things that were far worse than anything a man could ever do, partly because of their power and what they were capable of. For instance, after Apollo slayed Python he went around boasting about what he had done. When he saw cupid the child god of love, holding his bow with it's enchanting arrows Apollo came over and snatched the bow from him, throwing it onto the ground. "This weapon is not for a boy!" said Apollo. "This is a man's weapon!" Then, pulling out his bow he said, "With this bow I slew Python with one arrow!" The he walked away with his chin held high. Cupid was furious at being teased and ridiculed so he flew into the air and shot Apollo with a gold tipped arrow that whoever it peirced, would instantly fall in love with the next woman he saw. That next woman happened to be a young lady known as Daphne, daughter of the River god. Apollo instantly fell in love with her and began running towards her. However, before Apollo could run towards her, Cupid soared overhead and shot another arrow at Daphne that meant she would recoil from whoever loved her. So as Apollo ran towards her, Daphne ran away from him. They ran for ages and ages, Apollo shouting, "Don't run! I'm your friend! "and Daphne ran faster and faster. Eventually they came to a raging rushing river, Daphne was cornered! Quickly, Daphne prayed to her father to help her from Apollo and to escape his love. Her father answered and chanted a spell at her. instantly her arms became branches, her legs took root and her skin turned to bark. She was now a Laurel tree. Apollo rushed to her, and when he discovered what she had become, he stated. "Even as a tree you are dear to me. From now on the winners of the Olympics shall wear circlets of laurel leaves!" Daphne's trunk bended back. Even as a tree she recoiled from Apollo. This is a wonderful post Jake. I love the myth of 'Apollo, Daphne and the slaying of Python'. It is a great drawing of the python. I also love the squirrel photo - great shot.